Mark J. Schwarze, Edwin R. Gerler, Jr. The purpose of this exploratory study was to investigate the effectiveness of a modified mindfulness-based cognitive therapy intervention using individual counseling sessions to reduce stress and increase levels of mindfulness among nursing students. An AB single-subject experimental design replicated three times was implemented. Results indicated reduced stress in two out of three participants and increased mindfulness levels in all participants. Implications for college counselors and counselors working with clients in high-stress occupations are provided. Additionally, the results show promise for the use of mindfulness-based cognitive therapy in individual counseling. Mindfulness-based cognitive therapy (MBCT) has been described as part of a third generation of cognitive therapies (Harrington & Pickles, 2009). Along with dialectical behavioral therapy and others like it, MBCT has integrated the construct of mindfulness with standard cognitive-behavioral paradigms. MBCT found its origins in the work of Kabat-Zinn’s (1990) mindfulness-based stress reduction program. This 8-week group-based program consisted of Buddhist mindfulness mediation practices to help chronic pain sufferers reduce their stress associated with illness. MBCT has incorporated elements of mindfulness-based stress reduction and cognitive-behavioral therapy to help individuals become more aware of thoughts and feelings and put them into context as mental events rather than self-defining constructs (Teasdale et al., 2000). Seeing a need for an intervention to help patients who had repeatedly relapsed into depression, Segal, Williams, and Teasdale (2002) formalized MBCT as a standardized program of therapy. Designed as an 8-week program with specific guidelines for each session, MBCT was originally conceived as a group modality. Clients are placed in classes to learn the mindfulness and cognitive-behavioral (Beck, Rush, Shaw, & Emery, 1979) skills needed to regulate emotions and thoughts. MBCT involves training the mind to avoid judgmental reactions to events, thoughts, feelings and body sensations and to practice nonjudgmental awareness and acceptance (Ma & Teasdale, 2004). The key component of MBCT is mindfulness. Mindfulness, once an abstract concept in the counseling field, is reaching mainstream awareness and gaining more attention in the literature (Brown, Marquis, & Guiffrida, 2013). Derived from Zen Buddhism, mindfulness has been described as a commitment to bringing awareness back to the present moment (Harrington & Pickles, 2009). Brown and Ryan (2003) defined mindfulness as “the state of being attentive to and aware of what is taking place in the present” (p. 822). Despite a growing research base, mindfulness as a testable and operationally defined variable is still being shaped. Bishop et al. (2004) proposed an operational definition of mindfulness as a two-component skill-building approach for responding to emotional and cognitive distress. The first component involves the self-regulation of attention. Measurable skills must be obtained to reach a successful level of self-regulation of attention, including sustained attention; switching, or bringing the attention back to a focal point; and inhibition of elaborative processing, which involves the ability to maintain a state of flexible and nonjudgmental focus and awareness over a period of time. The second component includes developing an orientation to experience. In this, all thoughts, feelings and sensations are acknowledged. Mindfulness training works well in counseling in that it is a simple idea: staying focused on momentary experience (Grabovac, Lau, & Willett, 2011). The core strategy to teach clients is mindfulness meditation. Meditation has many forms but is ultimately the practiced skill of quieting the mind (Wright, 2007). Counselors trained in meditation can teach clients to sit quietly and observe thoughts and feelings without reaction or judgment (Brown et al., 2013). A version of this meditation is the 3-minute breathing space (Segal et al., 2002). This meditation approach is a core skill learned in MBCT. It utilizes the breathing techniques of meditation while attempting to bring awareness to present experience, focusing on breath as a mediator and expanding to other bodily sensations. Because mindfulness is rooted in Buddhist philosophy and belief, its inclusion in Western counseling paradigms has been slow. Most interventions and models consisting of mindfulness-based ideas have been stripped of the Eastern religious and philosophical foundations and presented as skill-based acquisitions (Baer, 2003). This change has increased acceptance of mindfulness-based approaches in mainstream treatment and educational venues. Specifically, using mindfulness to mitigate stress has been a benefit of this practice. One particular population that has historically reported high levels of stress is nursing students (Beddoe & Murphy, 2004). The Spring 2013 American College Health Association’s National College Health Assessment (American College Health Association, 2013) listed stress as the number-one impediment to academic success for college students. Specifically, college students training to be nurses at the university level are subjected to high levels of stress (Gibbons, Dempster, & Moutray, 2011). Pulido-Martos, Augusto-Landa, and Lopez-Zafra’s (2012) review of the literature on the nursing student experience found several factors leading to stress, including balancing home and academic demands, experiencing time management pressures and financial problems, lacking meaningful connections with the nursing faculty, and feeling unprepared and incompetent in clinical practice. In addition, stress, combined with other issues, has led to significant attrition rates in nursing programs (Harris, Rosenberg, & O’Rourke, 2014). Stickney (2008) found that the number of new students in nursing programs is too low to ensure an adequate number of nurses to meet the future needs of health care agencies. Students in nursing programs experience significant amounts of stress from trying to balance their lives at home with academic responsibilities. It is imperative that counselors, especially those in college settings, are aware of effective and innovative interventions to help nursing students, as well as other students, reduce stress and be successful. MBCT has shown promise in helping people reduce negative emotions such as stress (Collard, Avny, & Boniwell, 2008; Teasdale et al., 2000). This study utilized a modified version of MBCT in individual counseling sessions to teach and process MBCT core skills of mindfulness meditation and cognitive decentering. While MBCT has mostly been utilized in group formats, there is some argument that group counseling is not always the best approach. Kuyken et al. (2008) found that 5% of an eligible sample for their MBCT study declined participation because they did not like the group aspect of the intervention. Lau and Yu (2009) suggested that offering mindfulness-based treatments in an individual format might increase participation for those who are reluctant to be involved in group settings. The purpose of this exploratory single-subject experimental study was to evaluate the effectiveness of using MBCT to help reduce stress among university nursing students. Nursing students were used because of their documented high levels of stress. The questions explored included whether using MBCT in individual sessions increases self-reported levels of mindfulness and decreases self-reported levels of stress. Single-subject design has a long history in psychological and counseling research (Heppner, Wampold, & Kivlighan, 2008). Barlow and Hersen’s (1984) exposition on the chronology of single-subject design reveals that psychology’s early research development was steeped in the use of this type of experiment. Lundervold and Belwood (2000) called single-subject experimental design “the best kept secret in counseling” (p. 92). This design can provide counselors with scientific methods of research that produce practical and useful clinical information that can be applied to practice settings. There are several advantages of using a single-subject experimental design. It allows the researcher to narrow causes of behavior change and determine which treatment approaches are most effective. Group designs often can obscure change in individuals, thereby not allowing flexibility in modifying treatment protocols to isolate examples of cause and effect (Barlow & Hersen, 1984). Morgan and Morgan (2003) posited single-subject design as the best option when trying to explain individual differences. Another advantage of single-subject experimental design is that because the researcher collects data using a baseline and intervention phase, the subject acts as his or her own control group, thereby increasing internal validity (Sharpley, 2007). Additionally, single-subject design can allow for scrutiny of new and innovative approaches (Chapman, Baker, Nassar-McMillan, & Gerler, 2011). Specifically, this study utilized a basic single-subject experimental AB design that allows for a maximum clinical utility. Participants in this study were all senior-level students enrolled in a Bachelor of Science in Nursing (BSN) program at a small rural Southeastern university. Four of the participants were female and one was male. Participant ages ranged from 21–30 years old (mean age 25.6 years). Three of the participants were Caucasian, one was Hispanic American and one was Native American. The Perceived Stress Scale (PSS) was developed by Cohen, Kamarck, and Mermelstein (1983) to measure the degree to which one evaluates situations and events in his or her life as stressful. Specifically, the 10-item version of the PSS (PSS-10; Cohen & Williamson, 1988) measures the degree to which one perceives life as uncontrollable, unpredictable and overloading. The PSS-10 typically requires participants to answer questions based on their experiences in the past 30 days. A modification for this study was asking participants to answer the questions based on their experiences and thoughts in the past 7 days, as the study was focused on weekly variability. The PSS-10 has a Likert-type rating scale and is widely used as a measure of perceived stress. It is shown to have internal reliability (coefficient alpha of .78) with established construct validity, as the PSS-10 scores have shown moderate relation to other measures of appraised stress. Scores can range from 0–40, with higher scores indicating greater stress. Roberti, Harrington, and Storch (2006) found the PSS-10 reliable and valid with a non-clinical sample of college students. Mean scores for males were 17.4 (SD = 6.1); mean female scores were 18.4 (SD = 6.5). Also used in the study was the Mindful Attention Awareness Scale (MAAS), a 15-item scale designed to measure characteristics of openness or receptiveness to what is taking place in the present (Brown & Ryan, 2003). The MAAS aims to assess the level at which one is able to observe what is happening without judgment. The MAAS assesses the absence or presence of mindful mental states over time. For this study, participants were asked to form their answers based on experiences and thoughts over the past 7 days. Normative information is available for college populations (14 independent samples: N = 2,277; M = 3.83, SD = .70). Cronbach’s alphas range from .80–.90. The MAAS also has shown high test-retest reliability, discriminant and convergent validity, and criterion validity (Brown & Ryan, 2003). MacKillop and Anderson (2007) confirmed validity and reliability of the MAAS with internal reliability scores of .89. Participants volunteering for the study were scheduled individually for an appointment to meet with the researcher to complete a study orientation and start baseline measurements. This 30-minute meeting consisted of an introduction to the study and the researcher, obtaining a brief background of the participant, a definition of mindfulness, completion of the informed consent paperwork, and completion of a short participant demographic form. Additionally, the first baseline measurements with the PSS-10 and MAAS were collected at the end of this meeting, and the final three baseline measurements were scheduled. Each baseline meeting consisted of an informal discussion about academic and personal stress levels and completion of the dependent measures. In total, four baseline measurements were collected over 5 weeks. The intervention phase (B) consisted of six 1-hour sessions conducted over 5.5 weeks starting at the conclusion of the baseline phase (A). Session one began on the first week of classes in a spring semester, and sessions two through five occurred during each subsequent week. The final session, a wrap-up and review, was scheduled for the beginning of week six of the intervention. Each session consisted of 50 minutes focusing on MBCT skills, concepts and homework assignments, and 10 minutes at the end of the session to administer the dependent measures. At the final session, the researcher explained procedures and options for counseling if the participant desired to continue exploring MBCT or other issues that may have come up during the study period. Additionally, all participants received mindfulness resources such as book and Web site lists in order to continue learning and practicing mindfulness exercises. MBCT is traditionally an 8-week intervention conducted in group or class settings (Teasdale et al., 2000). Because this study utilized individual counseling, the intervention was reduced to six sessions, and session length was reduced to 1 hour. The individual counseling modality allowed for more focused attention to participants, and exercises could be consolidated. Also, MBCT was originally used to treat clients with chronic relapsing depressive disorders, while stress was the target symptom in this study. Due to this shift in focus, some of the exercises and homework assignments relevant to those who might have depression were not included in the intervention. Another modification included the use of prerecorded guided meditations for body scans and breathing instead of researcher-led meditations. During sections of the intervention when a meditation was introduced and practiced, the researcher started a prerecorded meditation and left the room while the participant experienced the meditation. The prerecorded breathing and body scan meditations used for this study were from the Maddux and Maddux podcast (2006). The modified intervention still utilized the core MBCT exercises and philosophy. The next section includes a description of the major techniques used and what modifications were made to accommodate the study goals. Also included is an outline of the six session themes. Theme 1: Using Mindfulness to Break Out of Automatic Pilot focuses on an orientation to mindfulness and techniques to develop a heightened awareness of the present moment. Theme 2: Focus on the Body Enhances Clarity of the Mind, and Theme 3: Mindfulness of the Breath introduce the exercises of the body scan and breathing mediation. Theme 4: Acceptance promotes nonjudgmental acceptance of events, cognitions and emotions. Theme 5: Thoughts Are Not Facts is an educational session about cognitive-behavioral philosophies and their impact on moderating emotions. Theme 6: Putting It All Together provides a summary of the ideas and techniques of MBCT, with suggestions on how to integrate the concepts daily. The modified structure and content used is unique to this study; however, the specific components, homework and exercises are taken from Segal et al. (2002). Table 1 describes the schedule and order of session content, including session themes and agendas. Raisin exercise. Used as an introduction to mindfulness, this exercise asks participants to take a raisin offered by the researcher and examine all aspects of its shape, texture and external characteristics. Open-ended questions are asked to help participants explore their experience. Body scan meditation. The exercise brings a detailed awareness and focus to specific areas of the body. A modification in this study included using a shorter meditation (8 minutes; Maddux & Maddux, 2006). Be mindful during a routine activity. Participants are asked to choose a routine activity (e.g., brushing teeth, vacuuming, washing dishes) and to complete it mindfully per the study’s training. Homework record forms. Used in all sessions, these forms allow participants to document the frequency of practice of mindfulness activities. Thoughts and feelings exercise (professor sends an e-mail). In this exercise, the researcher presents a scenario to elicit participant reaction. Pleasant and unpleasant events calendars. Participants receive forms (Segal et al., 2002) that help them identify one pleasant event per day in week two and one unpleasant event per day in week three. Five-minute hearing exercise. Participants are asked to sit for 5 minutes with eyes closed and center all of their focus on hearing. When intrusive thoughts enter, participants are instructed to acknowledge them, but then return their focus to only hearing. Three-minute breathing space. A core skill in MBCT, this exercise acts as a mindfulness timeout. Twenty-minute sitting meditation. This meditation is a combination of all the skills participants have learned, including the body scan, breathing meditations and the hearing exercise. Moods, thoughts and alternative viewpoints discussion. This exercise involves a short overview of how thoughts can influence mood, and techniques and suggestions for viewing intrusive thoughts in a different way. Handouts titled Ways You Can See Your Thoughts Differently and When You Become Aware of Negative Thoughts are provided (see Segal et al., 2002). Breathing meditation. This exercise brings a detailed awareness and focus to the breath. A modification in this study included using a shorter (9 minutes) recorded breathing meditation (Maddux & Maddux, 2006). Mindfulness resources handout. Researchers generate a list of books, Web sites and podcasts that describe mindfulness and the techniques associated with the study. The participants receive this at the last session with encouragement to continue to seeking information on mindfulness practice if they have found it helpful. 1 Using mindfulness to break out of automatic pilot Orientation to mindfulness and MBCT, raisin exercise, body scan introduction and practice, assign homework: use body scan tape six times before next session, be mindful during a routine activity. Provide handouts: Definition of Mindfulness, Summary of Session 1, homework record forms (Segal et al., 2002). Administer PSS-10 and MAAS. 2 Focus on the body enhances clarity of the mind Body scan practice and review, homework review, thoughts and feelings exercise (professor sends an e-mail), introduction of pleasant events calendar assignment, 10-minute breathing meditation introduction and practice. Assign homework: use body scan tape six times before next session, use breathing meditation tape six times before next session, complete pleasant events calendar once a day. Provide handouts: Tips for Body Scan, Summary of Session 2, homework record forms, Mindfulness of the Breath, The Breath, Pleasant Events Calendar (Segal et al., 2002). Administer PSS-10 and MAAS. 3 Mindfulness of the breath Five-minute hearing exercise, 10-minute breathing meditation practice and review, homework review, introduction of unpleasant events calendar assignment, 3-minute breathing space explanation. Assign homework: use breathing meditation tape six times before next session, unpleasant calendar (daily) completed once a day, 3-minute breathing space three times a day. Provide handouts: 3-Minute Breathing Space Instructions, Summary of Session 3, homework record forms, Mindfulness of the Breath, Unpleasant Events Calendar (Segal et al., 2002). Administer PSS-10 and MAAS. 4 Acceptance Five-minute hearing exercise, 10-minute breathing meditation practice and review, body scan meditation practice and review, homework review, 20-minute sitting meditation introduction and practice. Assign homework: 20-minute sitting meditation six times before next session, 3-minute breathing space three times a day and as needed. Provide handouts: Sitting Meditation Extended Instructions (Segal et al., 2002), Summary of Session 4, homework record forms. Administer PSS-10 and MAAS. 5 Thoughts are not facts 20-minute sitting meditation practice and review; homework review; moods, thoughts and alternative viewpoints discussion; 3-minute breathing space. Assign homework: 30-minute breathing meditation (three times a week), 3-minute breathing space (three times a day). Provide handouts: Ways You Can See Your Thoughts Differently, When You Become Aware of Negative Thoughts (Segal et al., 2002), Summary of Session 5, homework record forms. Administer PSS-10 and MAAS. 6 Putting it all together Body scan practice and review, breathing meditation practice and review, sitting meditation practice and review (10 minutes), homework review, review of all techniques used in study. Provide handouts: Daily Mindfulness (Segal et al., 2002), mindfulness resources (researcher generated), Summary of Session 6, Daily Mindfulness, Mindfulness Resources. Administer PSS-10 and MAAS. All five participants completed the baseline phase (A) of four weekly meetings to complete the dependent measures. A1–A4 represent weeks one through four of the baseline phase. Out of five participants, three participants completed the full intervention phase (B) of six weekly 1-hour sessions. B1–B6 represent weeks one through six of the intervention phase. The phases ran consecutively. One participant completed only two of the intervention sessions before withdrawing from the study. This participant cited a variety of issues including unexpected sickness and time constraints as deciding factors for withdrawal. Another participant completed three intervention sessions before withdrawing, citing time constraints and academic demands as reasons for withdrawal. The researchers have included the results for only the three participants who completed the full intervention, due to the importance in single-subject designs of multiple measurements of the dependent variable occurring over the complete span of the study in order to determine changes in self-reports of mindfulness and perceived stress. It is the comparison of the two full phases that allows interpretation of whether the intervention was the cause of the change. Participant 1 reported no previous experience with mindfulness activities. The baseline mean score on the PSS-10 for Participant 1 was 21.75. This baseline mean score is higher than that of the normative sample and indicates some experience of perceived stress. The baseline mean score on the MAAS was 3.07. This baseline mean score is lower than that of the normative sample and indicates less self-report of mindfulness as measured by the MAAS. The individual scores over the baseline period for the PSS-10 fluctuated, which may be related to the time of administration. The A1 and A4 scores were both 22, and both measurements were taken at high-stress academic times. However, Participant 1 earned the highest score in the baseline phase (25) at A3, on Christmas Eve. These scores support the literature that found several factors leading to nursing student stress, including home and academic demands (Magnussen & Amundson, 2003). Alternately, the individual scores over the baseline period for the MAAS were mostly stable with a significant drop in A4, which was collected on the last Friday before the spring semester started. With the focus that mindfulness places on staying in the present moment, as measured by the MAAS, the anticipation of the new semester may have taken precedence. Essentially, baseline scores on the PSS-10 were variable, as were the academic and home stressors, and MAAS scores were relatively stable, but below normative scores for college populations. The intervention mean score on the PSS-10 was 23. This score was 1.25 points higher than the baseline mean of overall self-reported stress as measured by the PSS-10. 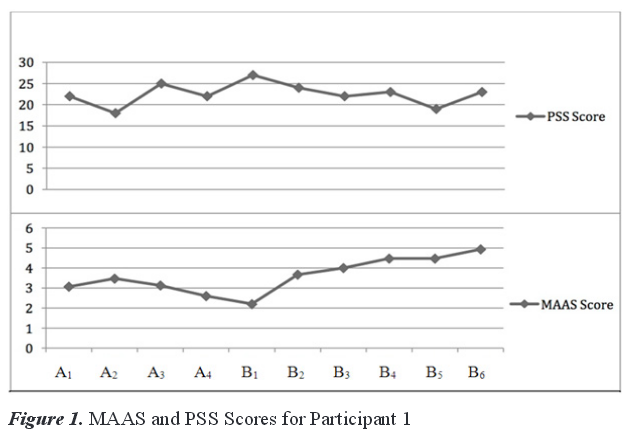 The individual scores of the intervention phase showed decreasing PSS-10 scores from B1–B3 while showing increasing MAAS scores at the same time for Participant 1 (see Figure 1). B4 showed a 1-point increase from B3 in PSS-10 scores, which coincided with Participant 1 experiencing a medical emergency. Despite this crisis, stress scores increased only minimally while mindfulness scores increased by .47 from B3–B4. MAAS scores continued to increase throughout the intervention phase, with the highest score of 4.93 reported at the final session. This finding indicated that increased exposure to and practice of mindfulness activities correlated with higher self-report of mindfulness scores. This result was confirmed by an increase of 0.88 in the mean scores on the MAAS from baseline to intervention and a gain of 2.73 from B1–B6 (see Figure 1). Table 2 provides the dependent measure scores for Participant 1. Note. Sessions A1–A4 were baseline sessions; sessions B1–B6 were intervention sessions. showed an increase in stress scores, with the highest baseline score (25) coming at A4. The individual scores over the baseline period for the MAAS were stable with the lowest score (2.33) reported at A1. 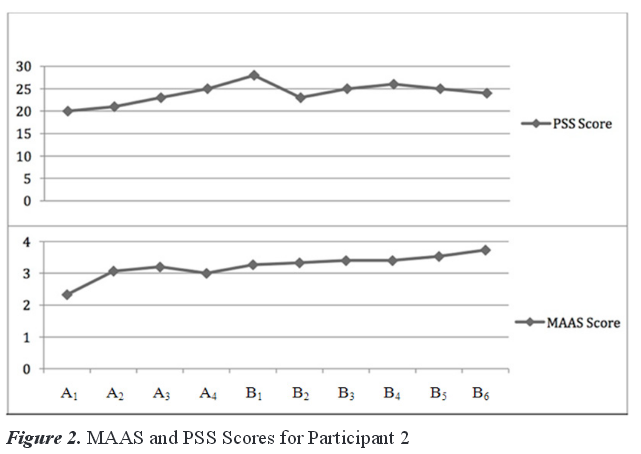 Baseline scores on the PSS-10 increased and MAAS scores were stable once past the initial baseline meeting, but still remained below the normative scores (see Figure 2). The intervention mean score on the PSS-10 was 25.17. This score represents a 2.92-point gain from the baseline mean in overall self-reported stress as measured by the PSS-10. However, there was a drop of five points on the PSS-10 from B1–B2. MAAS scores continued to increase throughout the intervention phase with highest score of 3.73 coming at the final session. There was an increase of 0.54 in the mean scores on the MAAS from baseline to intervention and a gain of 0.46 from B1–B6. Table 3 lists the dependent measure scores for Participant 2. Participant 3 reported no previous experience with mindfulness activities. The baseline mean score on the PSS-10 for Participant 3 was 20.75. This baseline mean score is higher than that of the normative sample. The baseline mean score on the MAAS was 2.7. This baseline mean score is lower than that of the normative sample. The individual scores over the baseline period for the PSS-10 showed a baseline high of 27 at A1. PSS-10 scores dropped eight points from A1–A2. The individual scores over the baseline period for the MAAS were stable from A2–A 4 with the lowest score (1.93) coming at A1. Participant 3 posted stable baseline scores on both the PSS-10 and the MAAS except for at the first baseline meeting. At this meeting, the stress score was high and the mindfulness score was low. The intervention mean score on the PSS-10 was 22.17. This score is a 1.42-point gain from the baseline mean in overall self-reported stress as measured by the PSS-10. There was a significant drop of seven points on the PSS-10 from B3–B4, and drops in stress score continued throughout the rest of the intervention phase. MAAS scores continued to increase throughout the intervention phase with highest score of 5.13 coming at the final session. This is an increase of 1.1 in the mean scores on the MAAS from baseline to intervention and a gain of 3.46 from B1–B6 (see Figure 3). Table 4 lists the dependent measure scores for Participant 3. The results indicate that exposure to an MBCT intervention can positively impact self-reported stress scores as measured by the PSS-10 and increase self-reported mindfulness scores as measured by the MAAS. All participants in this exploratory study showed gains in mindfulness levels as measured by the MAAS. These results likely occurred due to the fact that most participants began the study with no knowledge of or experience with mindfulness. Once exposed to the practice of meditation and other mindfulness exercises, the participants’ use of mindfulness processes increased steadily. PSS-10 scores fluctuated during the baseline phase, and that variability could be explained by academic events, evaluative and anticipatory, occurring at the time of administration of the dependent measures. Specifically, the A1 and A4 scores for Participant 1 were both 22. Both of these measurements were taken at high-stress academic times. However, Participant 1’s highest score in the baseline phase (25) came at A3, on Christmas Eve. These scores support the literature that found several factors leading to nursing student stress, including home and academic demands (Magnussen & Amundson, 2003; Pulido-Martos et al., 2012). Consequently, all three participants posted their lowest mindfulness scores on days that coincided with a high-stress academic event such as final exam week, or the day before the first week of classes. However, once the MBCT intervention phase began, two of the participants (1 and 3) showed steady drops in PSS-10 scores, and the third (2) showed conservative reductions, suggesting that the intervention was a likely factor in decreasing perceived stress among the three participants. However, Participant 3’s PSS-10 scores revealed a 1.42-point gain from the baseline to intervention mean. The overall gain in the intervention mean score can be attributed to an unusually high score of 28 on B3. Participant 3 did report increased personal and academic distress at this time in the study. This result also could indicate that the benefits of mindfulness practice can be preempted by reactive stress to specific events. More long-term practice of mindful activities might have mitigated the stress of these events. 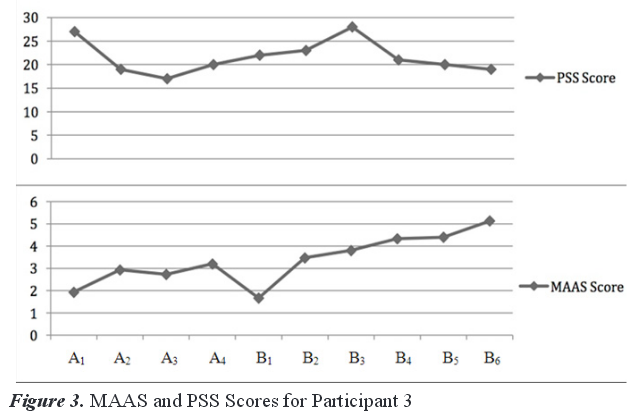 Participant 2 posted an overall 2.92-point gain from the PSS-10 baseline mean score to the intervention mean score. This increase may be attributed to an unusually high score of 28 on B1, perhaps because the first session of the intervention fell on the first week of classes for the spring semester. Additionally, Participant 2 had only 50 minutes of exposure to mindfulness activities at this time. However, there was a drop of five points on the PSS-10 from B1–B2. This decrease might be attributed to some type of novelty effect from being introduced to a new treatment (MBCT). This argument is strengthened by the fact that Participant 2 posted stable stress scores throughout the rest of the intervention. It should be noted that Participant 2 informed the researchers after B4 of the need to withdraw from the study due to time constraints and academic demands, but eventually decided to finish the study. This participant acknowledged feeling some personal distress throughout the next two sessions but did not report the need for any additional intervention. For Participant 2, it appears that MBCT was successful overall in increasing self-reported mindfulness levels as measured by the MAAS. Based on the small decreases in PSS-10 scores over time, and the continued self-report of personal distress through the final session, the MBCT intervention was only minimally successful in stress reduction for Participant 2. Homework assignments and additional meditation practice were highly encouraged in this study, but not required. All participants chose to complete some homework and practice meditations outside the study sessions; however, the reported time spent on meditation practice varied significantly. Ancillary findings from Collard et al. (2008) found a correlation between longer practice times of mindfulness and higher levels of mindfulness. An analysis of the data surrounding participant practice time and levels of obtainment of mindfulness would have been an interesting component to include in this study. One disadvantage of this study is the inherent limitation of single-subject design—specifically, external validity. Because this study included separate experiments with data on only three cases, it is difficult to make generalizations. However, external validity can be enhanced by replicating the design multiple times, thus strengthening possibilities for generalizations (Heppner et al., 2008; Hinkle, 1992). Additionally, Hinkle (1992) discussed issues related to the AB design, specifically stating that “cause and effect cannot be explicitly determined” (p. 392). The sample was motivated enough to volunteer for the study, which may mean that participants were more stressed than other nursing students and more motivated to seek solutions for stress. Alternatively, the willingness to volunteer for the study may have meant that these participants were less stressed and had more free time to participate in a weekly intervention. Another limitation was the modifications made to the MBCT intervention to accommodate the individual counseling modality. However, because of the exploratory nature of the study, modifications in future studies are warranted. The use of only one dependent measure for each dependent variable also presents limitations. The PSS-10 and the MAAS measure self-reported stress and mindfulness. The use of other instruments or data to measure the two dependent variables might have strengthened the study. Specifically, a mixed-methods design could have focused on the provided quantitative measures as well as qualitatively analyzing the homework forms and the participant’s verbal session content. Potentially, because of the timing of the study, and because stress is often linked with college student academic failure (American College Health Association, 2013), final exam grades and midterm grades could have been compared to assess for academic changes based on the introduction of the intervention. This study strengthens the growing research base on the use of MBCT. Specifically, it adds to the literature supporting the efficacy of MBCT in reducing stress. A unique contribution is the use of MBCT in a single-subject experimental design. Typically, MBCT is used in a class format; this study supports the potential efficacy of MBCT in individual sessions. Based on the above implications, this study also has implications for college counselors and counselors who work with those in stressful professions. Due to high attrition, academic distress and high-stakes testing, colleges are struggling to help their students succeed. College counselors provide services that address the academic and personal well-being of students. This study indicates that the use of MBCT in individual counseling to mitigate stress can yield promising results. College counselors and faculty members can work together to provide mindfulness-based workshops or other activities that promote a meditative approach. Developing effective partnerships should begin with an assessment of available mindfulness resources. Program administrators want their students to be successful and may be willing to integrate resources from outside the program. Many colleges and universities might have trained counselors on staff who can provide these services. If not, negotiations with certified off-campus meditation or yoga centers could provide reduced rates for students. More importantly, counselors can train faculty members in mindfulness exercises that they can integrate into the fabric of their programs. Embedding mindfulness into academic programs could be more effective and efficient if students perceive it as part of their education instead of an add-on. College counselors will do well to learn the language and culture of the academic programs on their campus. Crafting mindfulness interventions to correspond directly with the stressors of a certain program might help develop rapport with students. This process could be collaborative, involving college counselors, educators and students. Also, sharing data gathered from program evaluations or studies with administrators can strengthen relationships by assisting with long-term programmatic goals. Future areas of research should include the use of MBCT and other mindfulness-based interventions in order to replicate these results. More research is needed on delivering MBCT in an individual format. Another component of this study that needs more exploration is whether a longer amount of time spent practicing mindfulness activities provides greater relief from self-reported stress symptoms. The next logical step is to complete a study using a larger sample. Experimental studies comparing the effects of MBCT with more traditional counseling approaches aimed at reducing stress and improving performance could prove useful. How, for example, might MBCT compare to rational-emotive or rational-behavior approaches to reducing stress? Additionally, given the evolving nature of technology-based counseling interventions, future research on MBCT also might explore the value and usefulness of online MBCT interventions. Examining and comparing the effectiveness of synchronous versus asynchronous MBCT interventions would be especially valuable. the development of this manuscript. American College Health Association. (2013). American college health association national college health assessment II: Reference group executive summary spring 2013. Hanover, MD: Author. Baer, R. A. (2003). Mindfulness training as a clinical intervention: A conceptual and empirical review. Barlow, D. H., & Hersen, M. (1984). Single-case experimental designs: Strategies for studying behavior change. Elmsford, NY: Pergamon. Beddoe, A. E., & Murphy, S. O. (2004). Does mindfulness decrease stress and foster empathy among nursing students? Journal of Nursing Education, 43, 305–312. Bishop, S. R., Lau, M., Shapiro, S., Carlson, L., Anderson, N. D., Carmody, J., . . . Devins, G. (2004). Mindfulness: A proposed operational definition. Clinical Psychology: Science and Practice, 11, 230–241. Brown, K. W., & Ryan, R. M. (2003). The benefits of being present: Mindfulness and its role in psychological well-being. Journal of Personality and Social Psychology, 84, 822–848. Chapman, R. A., Baker, S. B., Nassar-McMillan, S. C., & Gerler, E. R. (2011). Cybersupervision: Further examination of synchronous and asynchronous modalities in counseling practicum supervision. Counselor Education and Supervision, 50, 298–313. Cohen, S., & Williamson, G. (1988). Perceived stress in a probability sample of the United States. In S. Spacapan & S. Oskamp (Eds. ), The social psychology of health: Claremont symposium on applied social psychology (pp. 31–67). Thousand Oaks, CA: Sage. Harrington, N., & Pickles, C. (2009). Mindfulness and cognitive-behavioral therapy: Are they compatible concepts? Journal of Cognitive Psychotherapy, 23, 315–323. Harris, R. C., Rosenberg, L., & O’Rourke, G. (2014). Addressing the challenges of nursing student attrition. Journal of Nursing Education, 53, 31–37. doi:10.3928/01484834-20131218-03. Heppner, P. P., Wampold, B. E., & Kivlighan, D. M. (2008). Research design in counseling (3rd. ed.). Belmont, CA: Thomson-Brooks/Cole. Hinkle, J. S. (1992). Computer-assisted career guidance and single-subject research: A scientist-practitioner approach to accountability. Journal of Counseling and Development, 70, 391–395. Kabat-Zinn, J. (1990). Full catastrophe living: Using the wisdom of your mind to face stress, pain, and illness. New York, NY: Bantam Dell. Kuyken, W. R., Byford, S., Taylor, R. S., Watkins, E., Holden, E., White, K., . . . Teasdale, J. D. (2008). Mindfulness-based cognitive therapy to prevent relapse in recurrent depression. Journal of Consulting and Clinical Psychology, 76, 966–978. doi:10.1037/a0013786. Lau, M. A., & Yu, A. R. (2009). New developments in research on mindfulness-based treatments: Introduction to the special issue. Journal of Cognitive Psychotherapy, 23, 179–184. Ma, S. H., & Teasdale, J. D. (2004). Mindfulness-based cognitive therapy for depression: Replication and exploration of differential relapse prevention effects. Journal of Consulting and Clinical Psychology, 72, 31–40. Magnussen, L., & Amundson, M. J. (2003). Undergraduate nursing student experience. Nursing and Health Sciences, 5, 261–267. Morgan, D. L., & Morgan, R. K. (2003). Single-participant research design: Bringing science to managed care. In A. E. Kazdin (Ed. ), Methodological issues and strategies in clinical research (3rd ed., pp. 635–654). Washington, DC: American Psychological Association. Pulido-Martos, M., Augusto-Landa, J. M., & Lopez-Zafra, E. (2012). Sources of stress in nursing students: A systematic review of quantitative studies. International Nursing Review, 59, 15–25. Roberti, J. W., Harrington, L. N., & Storch, E. A. (2006). Further psychometric support for the 10-item version of the perceived stress scale. Journal of College Counseling, 9, 135–147. Segal, Z. V., Williams, J. M. G., & Teasdale, J. D. (2002). Mindfulness-based cognitive therapy for depression: A new approach to preventing relapse. New York, NY: Guilford Press. Stickney, M. C. (2008). Factors affecting practical nursing student attrition. Journal of Nursing Education, 47, 422–425. Teasdale, J. D., Segal, Z. V., Williams, J. M., Ridgeway, V. A., Soulsby, J. M., & Lau, M. A. (2000). Prevention of relapse/recurrence in major depression by mindfulness-based cognitive therapy. Journal of Consulting and Clinical Psychology, 68, 615–623. Wright, S. (2007). Meditation matters. Nursing Standard, 21, 18–19. Mark J. Schwarze, NCC, is an Assistant Professor at Appalachian State University. Edwin R. Gerler, Jr. is a Professor at North Carolina State University. Correspondence can be addressed to Mark J. Schwarze, Reich College of Education, Department of Human Development and Psychological Counseling, 151 College Street, Appalachian State University, Box 32075, Boone, NC 28608-2075, schwarzem@appstate.edu.